There’s a game going around blogland at the mo called blogger tag. It’s a new one on me, and I’ve only found out about it because it’s been done to me! My lovely friend Susan has tagged me, which involves me answering 11 of her questions before setting 11 of my own to 11 other bloggers. Having difficulty remembering that far back! I remember Looney Tunes i.e. Bugs Bunny & Daffy Duck etc. I’m not too widely travelled, but the one I revisit as often as I can is called Pinocchio’s, an Italian restaurant in Christchurch, Dorset. 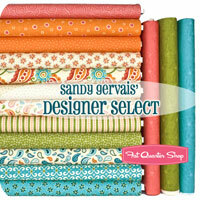 There are so many lovely fabric bundles to choose from, but I really love the orange and aqua mix of Sandy Gervais’ Designer Select Sassy Collection for The Fat Quarter Shop. Within the UK I’d say Bournemouth beach, because I lived there for 7 years (not actually on the beach of course!). But from family holidays as a child I remember The Algarve in Portugal having lovely beaches. 9. If you drink wine, what do you prefer – red, white or pink? If you don’t drink wine, what is your favourite drink? 10. What sewing task do you dread the most? 11. You are making me a dessert – what is it, and will you give me the recipe? I’m not known for my culinary skills (!!) but I can make pavlova (6 egg whites, sugar, vinegar, cornflour & vanilla extract, cream, fruit). 1. What is your favourite ice cream flavour/brand? 2. What kind of stuff do you like to watch on telly? 3. What are your favourite colour combos for fabric at the mo? 4 & 5. Who in your life do you most admire and why? 6. What inspired you to first start sewing/quilting? 7. What part of your body do you like the most? 8. Give me an example of something you have made that you are really proud of? 9. 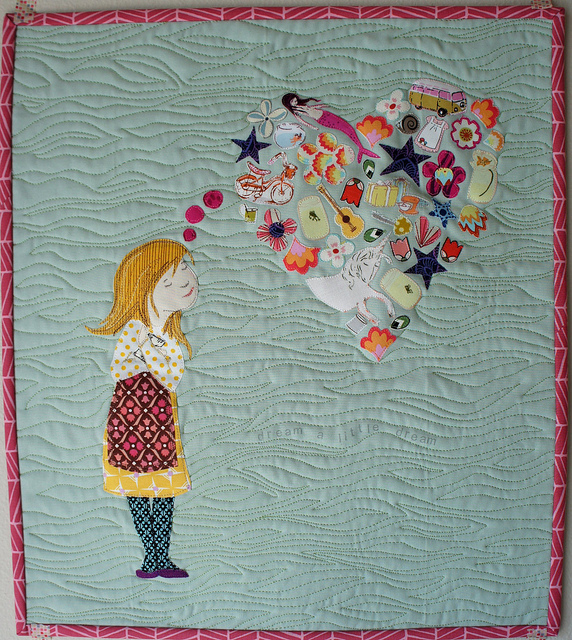 Would you describe yourself as more of a patchworker or a quilter, or both? 10. What has been your favourite decade so far? 11. What are you most looking forward to this year?